Of course, catalpas do occasionally play host to hungry hordes of their very own caterpillar; catalpa hornworms are the larval form of the catalpa sphinx moth (Ceratomia catalpae). The caterpillars only feed on catalpa trees. However, as I discovered with a huge northern catalpa (Catalpa speciosa) tree growing in our farm yard in West Virginia, catalpa hornworms make wonderful, almost sure-fired bass bait! The catalpa tree fed the hornworms and the caterpillars fed us many dinners of largemouth bass. No doubt my love for catalpa trees is rooted in this stately tree that supported so many tree-climbing expeditions and shaded so many family reunions. Perhaps my interest in entomology emerged from handling so many catalpa hornworms. Catalpas attract many other insects include a bevy of pollinators, particularly bumble bees. Indeed, catalpas support so many animals, some say catalpa trees have their own micro-ecosystems. One of the best write-ups I've ever come across about catalpa tress was written by Jim Woodworth, Director of Tree Planting for Casey Trees,Washington D.C., in his "Tree of the Month" column published in July, 2014. 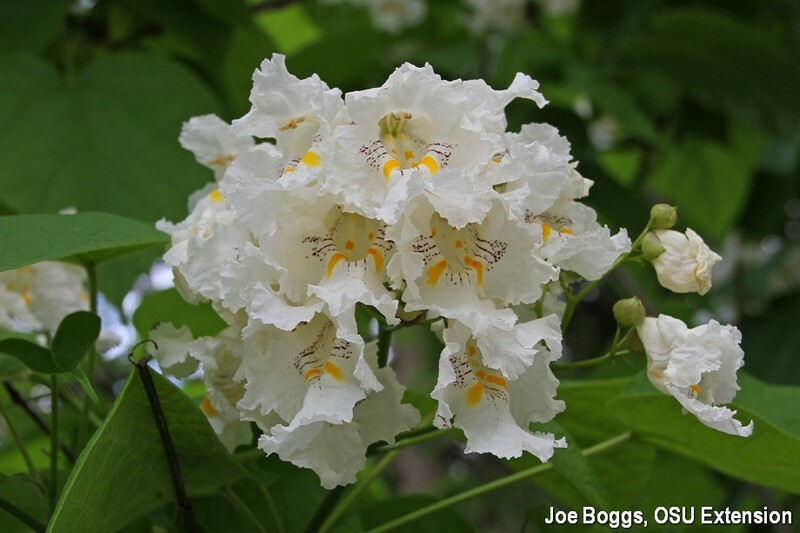 Whether or not you're a catalpa lover, or if you prefer the stately northern catalpa or its shorter southern cousin, (S. bignonioides), Jim provides a nice overview of the virtues of these resilient, native trees. Just click on the hotlink at the bottom of this article.